By Graig Graziosi | January 31, 2018 at 12:01a.m. 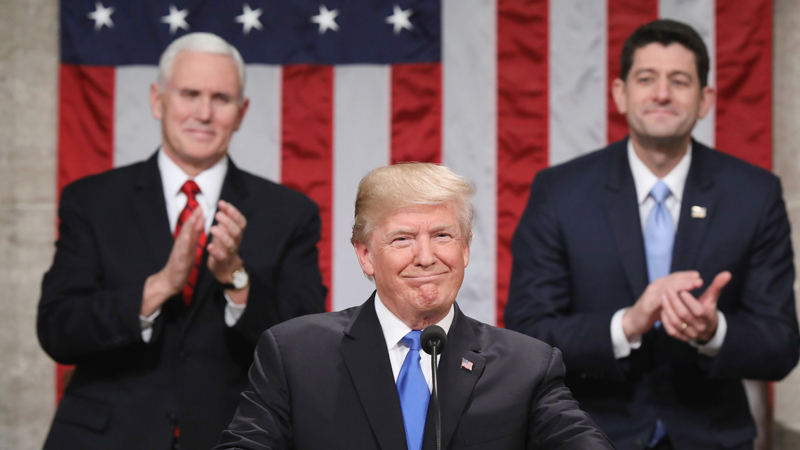 State and local lawmakers weighed in following President Donald Trump’s delivery of his first State of the Union address. Opinions on the address fell along party lines, as expected, and covered praises and grievances ranging from infrastructure permit reform to immigration crack-downs. Mahoning County Republican Party Chairman Mark Munroe gave a glowing review of the address. “Democrats and the American left are no doubt in a panic as President Trump continues to confound them. He was presidential, in fact inspirational, as he laid out the case that the state of the union is strong and getting stronger every day. Front and center were a surging economy, regulatory rollbacks, border security, the destruction of ISIS, judicial appointments, tax reform and the prospect of real immigration reform. The newest Trump initiative, a trillion-dollar infrastructure program, should have strong bi-partisan support. Most gratifying is the lowest unemployment rate in 45 years, benefiting all America, including African-Americans and Hispanics,” Munroe said in a statement. Mahoning County Democratic Party Chairman Dave Betras was markedly more critical of the address and the president’s performance thus far. “Unlike President Obama, Trump never mentioned Youngstown. Guess he forgot that he promised to rebuild the steel mills and urged everyone not to sell their homes because he was coming to our rescue. I guess it’s time to tell him to put up or shut up, or at least stop lying,” Betras said. “I appreciate the efforts of the Trump administration to make permitting reform a priority because it will improve our economy, create more jobs, and help us rebuild our infrastructure more quickly,” Portman said. U.S. Rep. Tim Ryan of Howland, , D-13th, chose to leave his guest seat vacant in honor of Amer “Al” Adi Othman, a local businessman who was deported to Amman, Jordan, Tuesday. Ryan wasn’t impressed by the address. “The president’s State of the Union address can be summed up in four words: more of the same. Although polished and read with a teleprompter, the rhetoric, fear-mongering, and falsehoods that President Trump so often leans on when facts elude him was as prevalent as ever. The president was carried into the White House in large part due to the promises he made to American workers – to fight for them every day so that their wages would rise, their pensions secured, and their futures brighter. He lied to them. And he’s done nothing but work against them since day one,” Ryan said in a statement. He went on to rail against the Trump administration over the deportation of Adi. “Amer Othman was a pillar of the Youngstown community. He started a business downtown, employed members of our community, paid his taxes, and raised a beautiful family—all in the Mahoning Valley. Today, he no longer resides in the country he’s called home for 39 years because the Trump administration decided to target upstanding individuals – Americans in every sense of the word – instead of violent criminals who actually pose a threat,” Ryan said. January 30, 2018 8:21 p.m.
January 4, 2018 12:01 a.m.
January 30, 2018 10:35 p.m.